SYSTEM FAILURE is an apexart Open Call Exhibition. Featuring work by: American Artist, Tega Brain & Surya Mattu, Demian DinéYazhi', Robbie Barrat, Faith Holland, Xandra Ibarra, Jenny Odell & Joe Veix, M Eifler aka BlinkPopShift, Mimi Onuoha, Caroline Sinders, and Stephanie Syjuco. And featuring a special interactive performance Masking Machine by M Eifler aka BlinkPopShift throughout the opening reception. Masking Machine is an interactive performance featuring the artist M Eifler aka BlinkPopShift dressed in a custom-made wearable augmented reality (AR) apparatus. 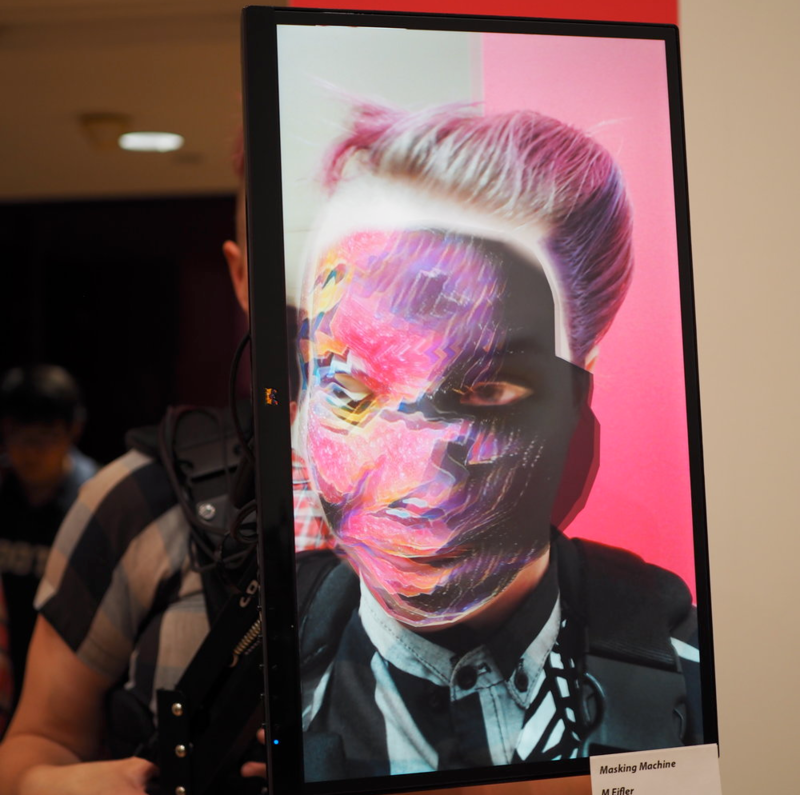 Using machine learning, the artist's software generates ever-evolving "digital makeup" displayed real-time on a screen in front of them, bringing audience, artist, and algorithm face-to-face. "Fail fast! Fail big! Fail often! Fail better!" These oft-quoted Silicon Valley mantras celebrate the high-octane risk taking that has been the hallmark of the tech world, but who really wins (and loses) when companies fail? Presented in San Francisco, a hub of technology and diverse artistic and social movements, SYSTEM FAILURE celebrates the creative potential of failure while also holding ourselves accountable to the injustices too often built into tech's data, algorithms, and networks. SYSTEM FAILURE presents work from a diverse group of media artists who explore ideologies of disruption, critique the social and political effects of technological breakdown, and tactically produce errors by building tools that are never meant to function. In responding to contemporary concerns, the works address the strengths and shortcomings of a wide range of local and global technologies. Installations address biases in the data used to build artificial intelligence alongside videos tracking the displacement of San Francisco's low-income communities. Playful sculptures trick companies that track our every step, while an interactive chatbot indicts police departments' dubious adoption of body cams. Human and computer-generated paintings demonstrate the inability of facial recognition to parse certain faces and also the playful pleasures of using machine learning to generate portraits. Other artists find pleasure in impossible connections, remix the imagery of corporate pitch culture, and create obfuscated codes and poems only they can understand. Collectively, these artists remind us of another idiom inherent to tech: too often failure isn't a bug, it's a feature. While genuine mistakes do get made, the biggest problems are often those that are built right into the system—due to faulty methods, short-sighted variables, or unreasonable arguments. SYSTEM FAILURE thus aims not to point fingers or dwell in defeat, but instead to build collective accountability for the systemic errors that occur at all levels of our sociotechnical stack. Cara Rose DeFabio is an artist, writer, and cultural strategist who enjoys producing live events that examine the role technology plays in our lives. She has explored the intersection of social justice and technology at the Real Future Fair, examined a basic income at the CASH Conference, and regularly performs her own brand of tech-curious theater in her hometown of San Francisco. An avid internet ethnographer, her interests have led her to report on the international slime trend, display her emoji artwork at the first ever Emoji Art & Design Show, and share the stage with Alexa and her mechanical turk bae in her most recent work, Virtual Girlfriend. Harris Kornstein is an artist, scholar, and activist whose work critiques digital culture and queer politics. He has exhibited internationally at ISEA, MIX NYC, Piksel and SOMArts, and as drag alter-ego Lil Miss Hot Mess, has performed at SFMOMA, OccupySF, and on Saturday Night Live. Harris's writing has appeared in Wired, The Guardian, and Salon, and his work with the #MyNameIs campaign and Drag Queen Story Hour has been covered by The New Yorker, The New York Times, Channel 4, and beyond. Harris holds an MFA from UC Santa Cruz and is pursuing a PhD in Media, Culture, and Communication at NYU. M Eifler is an artist and transdisciplinary researcher working in embodied interaction, speculative interfaces, and computational prosthetics. They have exhibited work or performed at TED in Vancouver, the Exploratorium, SFMoMA, the YBCA, and the Wattis Institute in San Francisco, XOXO, Wiensowski & Harbord in Berlin, Laurie M. Tisch Gallery and Armory Show in New York, Seattle International Film Festival, the Smithsonian Institution and Kennedy Center. Eifler graduated from California College of Art in 2011 with an interdisciplinary MFA where their research focused on consilience interfaces between representational systems.